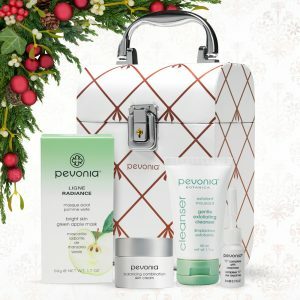 This year simplify your Holiday shopping with Pevonia’s 2018 Holiday Gift Collections. This elite assortment of cost saving and budget friendly gift sets are suitable for everyone on your list. Indulge in ultimate rejuvenation for total skin renewal! These Timeless treasures lavish the skin with some of nature’s finest phyto extracts and pure caviar to deeply nourish and counteract mature signs of aging. Timeless Balm Cleanser, 4 oz. Timeless Repair Lotion, 4 oz. Timeless Repair Serum, 1 oz. Timeless Repair Cream, 1.7 oz. Unearth your most divinely youthful skin! Infused with a revolutionary blend of argan and comfrey stem cells and supercharged de-agers, your restored complexion will have everyone asking for your skincare secret! Reveal a brilliantly matte complexion! Groundbreaking bio-actives and probiotic peptides work hand in hand with the skin’s natural functions to reduce the appearance of pores, even skin tone, and deeply hydrate for flawlessly perfect skin. Power Repair® Intensifier Micro-Pores™ Bio-Active Serum, 1 oz. Power Repair® Micro-Pores™ Refine Cream, 1.7 oz. Power Repair® Micro-Pores™ Bio-Active Mask, 1.7 oz. A powerhouse blend of vitamin C & E provides the ultimate solution to even and smooth your skin’s texture. Diminish visible age spots and sun damage for a dramatically refined complexion. Micro-Retinol® Essential Foaming Cleanser, 4 oz. Micro-Retinol® Essential Toner, 4 oz. Micro-Retinol® Essential Serum, 1 oz. Micro-Retinol® Essential Moisturizer, 1.7 oz. Correct and protect the key to immeasurable beauty… your skin! This de-aging collection of best-sellers features a powerful blend of marine collagen. It works to replenish nutrients in the skin while softening lines and wrinkles for instant youth-reviving benefits. Power Repair® Hydrating Cleanser, 4 oz. Power Repair® Hydrating Toner, 4 oz. Power Repair® Intensifier – Collagen & Myoxy-Caviar®, 1 oz. Power Repair® Marine Collagen Cream, 1.7 oz. Never miss a moment to shine with this collection of latest innovations. Brighten, conceal, and de-age with Pevonia’s all-natural formulations, your beauty must-haves for staying flawlessly fabulous. EyeRenew™ Conceal & De-Age Treatment, 0.34 oz. Rapid-Restore Lip Balm, 0.34 oz. Unlock the legacy of treasured skin! This targeted 2-in-1 cream and serum duo infuses your décolleté with a powerful blend of de-aging marine collagen and lifting marine elastin to restore your youthful luster. Power Repair® Hydrating Cleanser Trial Size, 1.7 oz. 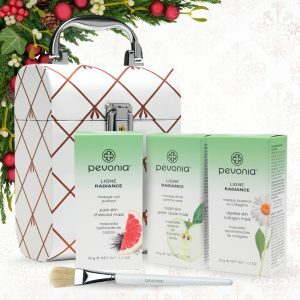 Experience the latest multi-masking trend with Pevonia’s New Radiance Mask Collection featuring micro-emulsified technology for deepest absorption and optimum de-aging, purifying, and brightening benefits! Unearth your skin’s classic beauty and be radiant! Crafted with green apple, red clover, and shea butter, this dynamic brightening and hydrating mask balances and controls shine for a healthy glow and picture-perfect complexion. Gentle Exfoliating Cleanser Trial Size, 1.7 oz. Balancing Combination Skin Cream Trial Size, 0.7 oz. “C” Complexe with Oxyzomes Trial Size, 0.17 oz. Unleash your inner Hollywood Starlet! A bewitching blend of micronized charcoal, shea butter, and grapefruit will leave your skin detoxified and mattified for a purely porcelain look. Phyto-Gel Cleanser Trial Size, 1.7 oz. Soothing Propolis Concentrate Trial Size, 0.17 oz. Keep your complexion forever timeless! Everyone will be asking your skincare secret with this robust youth-recovery mask infused with restorative and de-aging ingredients such as collagen, green tea, and chamomile. Power Repair® Marine Collagen Cream Trial Size, 0.7 oz. Power Repair® Intensifier – Collagen & Myoxy-Caviar® Trial Size, 0.17 oz. Infuse your senses with stress-free bliss! Wash away your worries and indulge in aromatherapeutic bathing pleasures that enrich your skin with restorative and de-aging benefits. Choose from three euphoric scents: Jasmine & Lavender, Peach & Vanilla, or Pineapple & Coconut. BodyRenew™ Bathing Pleasures Moisturizer, 6 oz. BodyRenew™ Bathing Pleasures Bubble Bath, 6 oz. BodyRenew™ Bathing Pleasures Bath Salts, 5 oz.